NJ Spotlight is a fantastic resource for me. They are unbiased in their approach to educate citizens on numerous topics, with education being one of them. I recently came across an opinion piece titled Putting New Jersey's High School Diplomas to the Test. The article focused on NJ's relentless push to increase standardized testing and institute end of course exams that students would have to pass in order to graduate. It really got me thinking about the direction we are headed in and the negative consequences that it will ultimately have on our learners. "NCLB was a dismal failure in raising academic performance or narrowing gaps in opportunity and outcomes. But its over-reliance on mandated testing did succeed in creating a narrative of school failure that undermined support for public education and led to a decade of bad policy in the name of reform." "In fact there is little evidence that an exit testing policy leads to better prepared graduates, improved college participation or completion rates, or benefits to a state’s economy. Less than half the states have high stakes graduation exams, and several that did recently ended them. A recent study from the National Bureau of Economic Research found that “challenging standards-based exams reduce graduation and increase incarceration rates.” The study found no corresponding positive effects on employment or earnings." "Current graduation tests don’t reliably measure what they pretend to measure (“intelligence,” “academic ability,” “college readiness”), and they don’t measure at all qualities all high school graduates should have (responsibility, resilience, critical thinking ability, empathy). The new tests are not likely to be much better. They must be given over computer networks many schools don’t have and will still mainly consist of multiple choice questions that assess a narrow range of skills and curricula." Please take a look at the entire NJ Spotlight article for more insightful information about the road ahead. 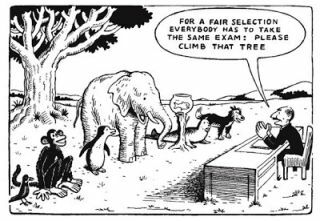 So what are we really testing students for? I have my opinions please share yours. Maybe this dialogue will resonate with policy and decision makers so that they can right the ship before it crashes.